The first card is the Nine of Swords and it symbolizes what you are going through right now. You are under a lot of psychological pain, and you feel like you can’t escape your head. You probably can’t sleep or eat. This card is telling you not to get sucked into the depression, and you are able to get yourself out of it. Possibly you’ve been spending too much time thinking about your situation that you are letting the darkness swallow you. You are strong enough to snap out of it. Get some fresh air. Take a meditation walk. It is your analytical mind that is not letting you rest because either you feel the need to analyze reasons and results. Let it go, things are not always in your control. The second card is another card that represents that you are trapped by your own thoughts. You have given your personal power to someone else resulting you in being weak and afraid. This possibly suggests that you have given your partner the power, and also suggests that he is not a good match for you. You feel trapped in this relationship and don’t know where to go or what path to choose- to stay or to go. The third card is the Six of Swords which signifies that you will need to make an important decision of leaving something in order to seek a better life and a better future. I sense that you feel the need that in order to survive, you need to stay in this relationship, but this is not true. You have made him your life and that’s the difficulty that you are not able to make a decision. You already know what you need to do, you are lacking the courage to do it. 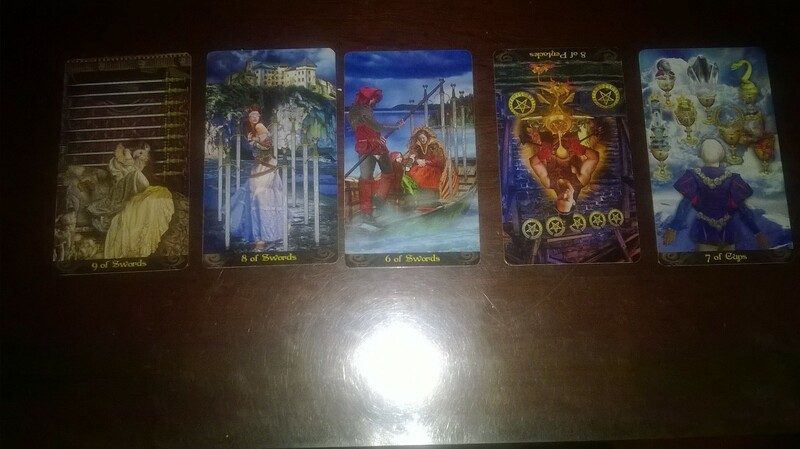 Also the first 3 cards are swords and means that there is a lot of thinking but not a lot of action in creating the change to a happier future. If you get a chance, please look at the image of the 3rd card. Connect with this card and have the courage and think of what kind of future you want. The fourth card is the Eight of Pentacles (reversed) and this suggests for you that another block is that you are holding onto a dream life you had with the other person. Things do not work out the way you anticipate. Sometimes we have to accept that there are certain people that come into our lives for a reason, and there are times things need to end for new things to begin. I know right now it is very difficult to see the light anywhere, but trust me, if you let go of your expectations on happiness and trust the universe, you will be able to see the light. It will just take time. The last card is the Seven of Cups and it suggests for you to let go of the fairy tale ending. There will be happiness in your future, but possibly not the way you envision it. And what seems what blocks you the most is a very rigid outcome of happiness has to include that person. Without this freedom of letting this idea go, you will stay trapped in this depression without any change. You are truly stronger than you realize, there is a brighter future for you if you take the risk of the unknown. Right now the same pattern is clearly not working. A question you can ask yourself is would you allow a friend of yours to have this relationship? This may give you more clarity. Please know that these cards are not set in stone and can change with your choices in life. Right now the guides are suggesting this is not a healthy environment and if you don’t make changes you are stumbling in major depression. If you do make the choice, you will leave with difficulty but you will be brave enough to do it. If you let go of expectations of what is needed for you to be happy, I do see a bright future for you.